The Mis lake is a reservoir basin, created in 1962-64 by a dam belonging to the Italian energy national company ENEL. It captures waters from the Mis river, which flows within the boundaries of a national natural park, the Parco Nazionale delle Dolomiti Bellunesi. The Dolomiti mountains have been declared a World Heritage site by UNESCO in 2009. However, last year, the Energie Valsabbia (Eva) group proposed to build a new hydropower generation plant upstream the lake, in order to exploit the poor water flow before it goes into the reservoir. The company, led by its president Enrico (Chicco) Testa -now president of the pro-nuclear lobby group Forum Nucleare Italiano-, pushed for its construction with the compliance of the Parks Authority and the Regione Veneto, even if the Italian law would not allow so. The park legislation in fact forbids such infrastructure due to the fragile mountain environment. Moreover, part of the construction works were on common land (usi civici) without any legal permission and caused deforestation. While construction has already started, local organizations have mobilized and filed a case at the National Water Tribunal. The Rome-based tribunal issued a curious order which confirmed authorization to Valsabbia while considering hydel projects as traditional economic activity in that area and permitted within the parks boundaries. Local Ejos appealed to this order at the High Court (Corte di Cassazione) which finally ruled a stay to the project (November 2012). This order confirmed an important principle which says that environment and riverine ecosystem should be given priority while considering any activity in the park. Energie Valsabbia first tried to co-opt local Ejos, offering them money and finally threatening them with extraordinary compensation claims. Since the High Court order was issued, the company has been claiming 34 million euros for compensation from the Parks Authority and to the Regione Veneto for issuing the permission illegally. Local ejos are determined in not allowing public money to be given to the company for compensation and to make sure that only those responsible will pay. Up to now, the dam is partly built up, deforestation has already occurred, water pipes have been placed under the road for many meters and nobody is taking care of clearing the construction site and removing dangerous materials (like batteries, etc...). Local ejos are discussing what to do with the dam now; some want it to be dismantled, others propose to leave some of its parts there, in memory of the won struggle. 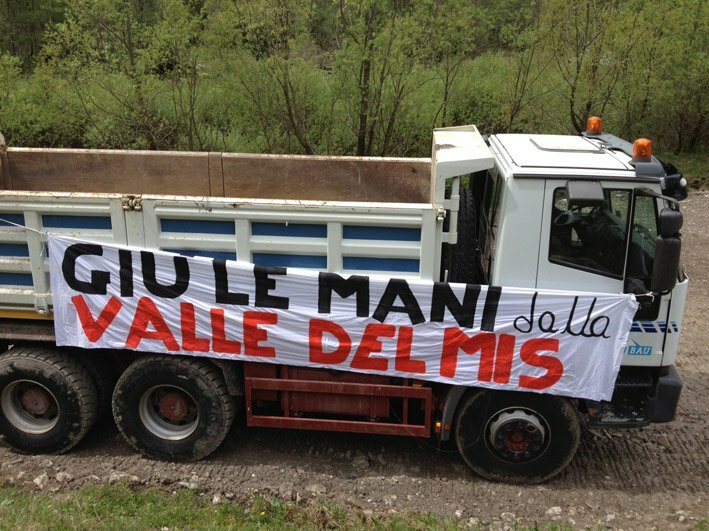 Thanks to these and other local mobilizations, the local committee Acqua Bene Comune Belluno lodged a complaint with the EU Commission in June 2013 against the Italian state, Regione Veneto, Province of Belluno and Autorità di Bacino dei fiumi dell’Alto Adriatico, for the over-exploitation of mountain rivers for hydropower. Project Details Run-of-the-river dam The Energie Valsabbia (Eva) estimated the production of 6500 MWh/year. Development of Alternatives Exclude further infrastructure construction in the park and leave free flowing rivers. Moratorium on current proposed projects. Clear definition of the minimum flow requirement by EU and national policies. Why? Explain briefly. The newly proposed hydroelectric power plant has been stopped through a massive mobilization which resulted in a stay to the project ordered by the Corte di Cassazione (Italian Supreme Court). Local committees also made a complaint to the European Commission against over exploitation of hydropower in the Alps, which could open the path to other similar initiatives.